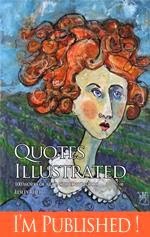 The Illustration Friday prompt this week is Proverb which I could probably illustrate until the cows come home. I like to get the majority of a drawing done on my lunch hour so that I can paint, scan and post when I get home from work. I started off with the proverb "it's no use crying over spilt milk" but couldn't get the glass right so quickly scrapped that in favor of something simple and a bit more upbeat. Don't worry--I'm not crying over that failure. The scan doesn't really show the metallic silver paint inside the cloud, but it looks quite nice in person. 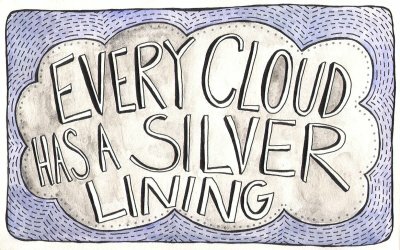 Have you experienced any silver linings lately? ...and it looks quite nice here, too! Your typography has so much texture. Fantastic work.